3-way motorizable rotating mixing valve. Connections: female. 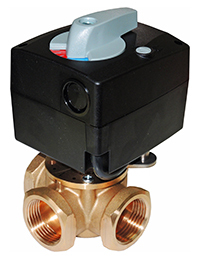 Rotating mixing valve made of forged brass suitable for heating and cooling installations. Yellow finish. 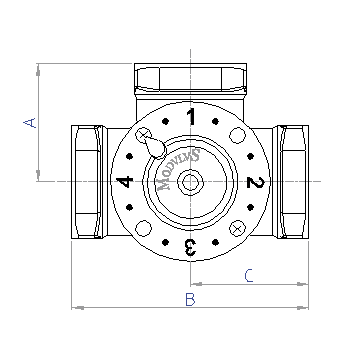 The valve can be motorized with a servomotor of the ModvlvS range or with another one on sale. The special proportional shape of the adjustment vane makes linear the working of the valve and it allows installations always symmetric. 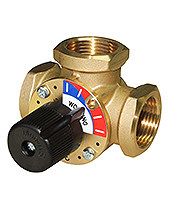 An easy numbering on the upper part of the valve helps to understand correctly the connection schemes indicated in the instruction sheet, without any possibility of mistake. As concerns the manual working an additional stained indicator fixes the working field and the working direction in an univocal way. Torque 5 Nm. 230V, IP40. Please add the suffix -NR to the code of the valve.